How would you like to have the opportunity to be able to win your share of $100,000 without havingto pay any money for entry into the tournament. The only cost of the tournament is 2,000 Full Tilt Points which you earn while playing in any ring game or any tournament. One of the easiest ways to earn your points is to play during “Happy Hour” when you can earn double points and sometimes even triple points depending on the promotions going on. Another way to earn the 2,000 Full Tilt Points is to play in one of the “Freeroll to the Holiday 100k” which happens during different times of the day everyday until the tournament and the top three players in the tournament will each receive an entry into the “Holiday 100k”. There currently is two separate dates for two separate “Holiday 100k” tournaments that will be played. Those dates are December 27th and December 28th. The reason why there is two separate tournaments is because at first Full Tilt Poker was going to only have one but there was such demand for the tournament that they decided to add another tournament. So that means that a player possibly has two chances at winning their share of $100,000. The maximum number of players for each tournament is 7,000 players and right now the first tournament as a little over 6,500 players signed up to play and the second tournament still has under 3,000 players signed up to play. Each tournament has a guaranteed prize pool of $100,000, so that means that the first place winner will receive a nice payday of $8,000 and the second place finisher will receive $5,600. Another piece to note is that each tournament will be paying the top 540 finishers and the lowest amount a player can win is a cool $100. 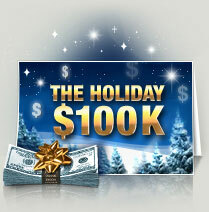 If you would like to get a chance at playing in the “Holiday 100k” then visit our Full Tilt Poker poker room review. Good Luck and Happy Holidays.